Bonjour lecteurs! As you already know, Baba is a huge fan of Brio toys. It all started with a blue car we bought him when he was smaller and since then, we have expanded the collection slowly but surely. Any big event such as Christmas or his birthday would be l’excuse parfaite to get him a new toy from this fab brand. A garage, many trains and cars later, he is still in love with the brand! So let’s share with you now our very Frenchie BRIO My First Railway Battery Operated Train Set Review! 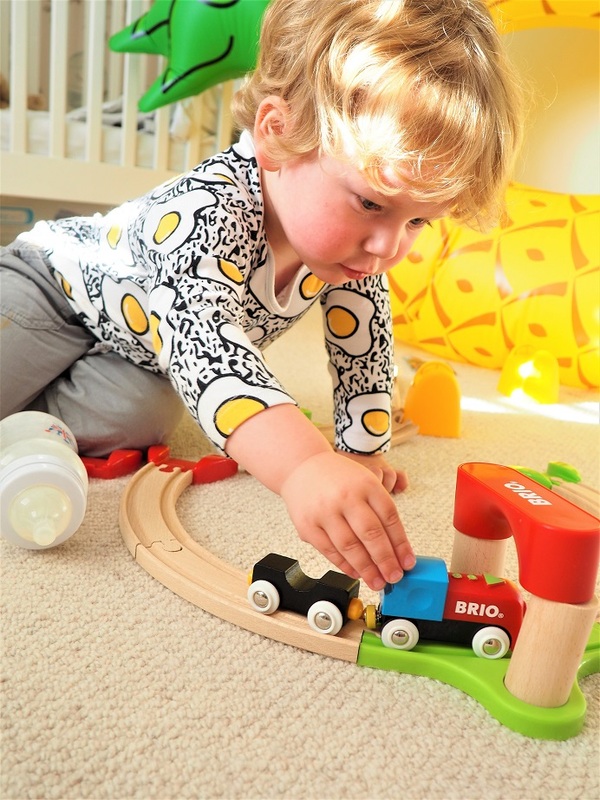 The BRIO My First Railway Battery Operated Train Set is designed for children aged 18 months and over. It comes in a box with about 25 pieces such as curves, mountain blocks, slopes and much more. But it is fab because more pieces mean more fun and imaginative stories for our little one! He was fast to get going and his own way too! As soon as Baba opened the box and we put it all together, a big smile appeared on his face! Like other toys from the brand, it is made of really good quality. Let’s Build Up the Tracks! As is it a railway battery, we were quick to assemble it all together. It’s very simple and it is so good for children to develop their building skills! Well, Baba did not have any of it! As soon as it was all done, he was in a hurry to take it apart and do it his own way! That is what is so cool with Brio toys. If you have other items from the collection, feel free to add them all up for a bigger world! 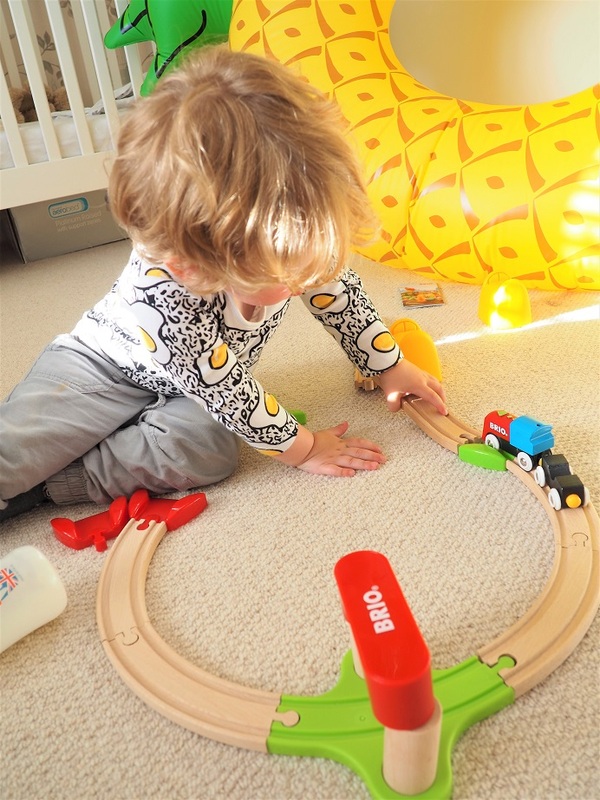 So Baba played with this super fabulous Brio My First Railway Battery Operated Train Set and added some bits from the Brio Classic Train we reviewed last month. It is part of the fun after all! The more the merrier! But what really got his attention was obviously the operated train. Simply insert the AA battery and you are all set for more fun! Under or over the curves, it is up to you! To start the engine (and the adventures going with it! ), simply press the arrow button on top of the engine and the train starts to move by itself! That is so clever! And facile to work it out too. Plus for a toddler, it is mega fun, let me tell you! And then, the discovery! Maman put the battery in! Time to have some mega fun! As always with Brio, the finishes are very well made and I like the bright and fun couleurs! Do you have a toddler who loves trains? Or cute wooden toys? Then you need to get them this super cute (and fast) BRIO My First Railway Battery Operated Train Set. The number of pieces means you can have so many possibilities when you create your railway. It’s fun but also built to last. Retailing at £44.95, it is a very nice gift idée for a birthday. Or for any occasion of your choice really! All you need to know is that your little one will be well busy with it. Plus it is built to last! 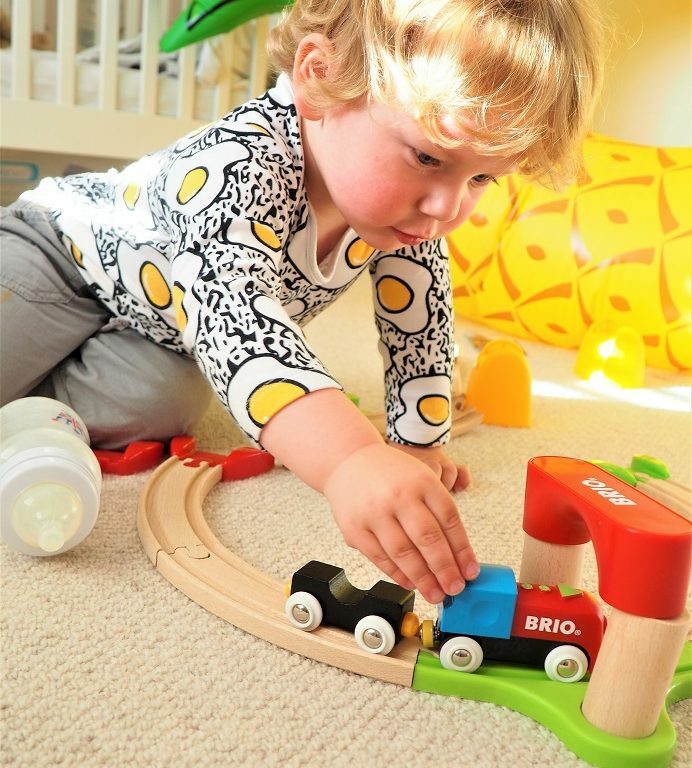 Thanks for reading our BRIO My First Railway Battery Operated Train Set Review. It is always such a plaisir to share with you new toys that we enjoyed. Disclosure: We received for free a BRIO My First Railway Battery Operated Train Set Review but all opinions remain our own. Brio tracks really do stand the test of time. Love the battery operated train option! I’ve seen this advertised in John Lewis and it ALWAYS gets kids and families around the test kits that are out so this looks like it would be a surefire hit with your kid! Brio is such a quality brand and I love that this is battery operated ? This looks fun with the added bonus of being made in wood! Such a pleasing change from the many plastic toys which seem to find their way into the toy cupboard. I shall certainly look out for it – it would make a lovely gift for a new grandson due in September! Aww wow this battery operated train set looks amazing! Much better than any train track my little ones have had. Your little boy looks very busy with the set. Battery operated train is great and looks amazing! The Brio Train track is awesome. A lot of my wife’s friends have these and they LOVE THEM. I think I am going to get one of these for my niece I know she loves trains! I love how the track is big and chunky, perfect for little hands to build and create with. I must admit, a battery operated train would have been a dream for me when I was little, and I know Luke would have adored it when he was younger too (he’d probably still love it now!) Looks like a great quality toy! 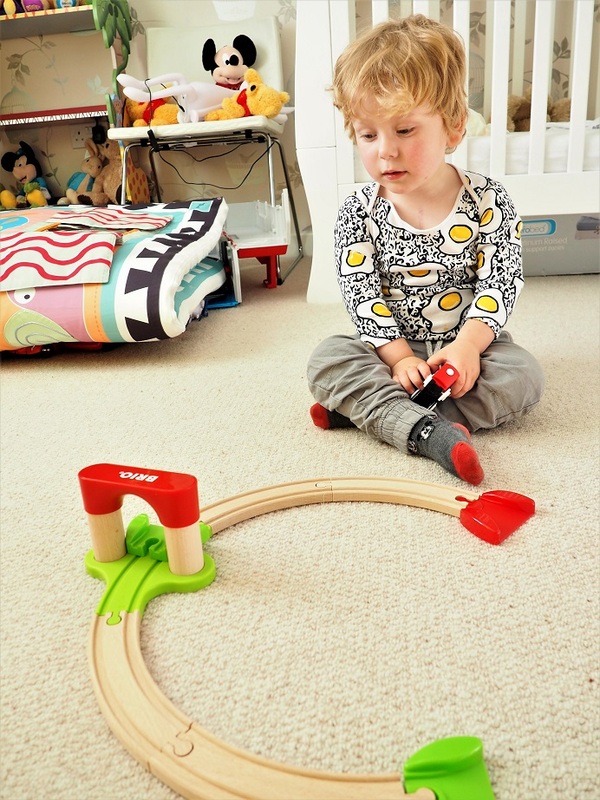 We love Brio wooden toys. I didn’t know they made a battery operated sets. Looks lovely. I love classic looking toys, this reminds me of one I had from the Early Learning Center. Mine wasn’t battery powered though, haha. 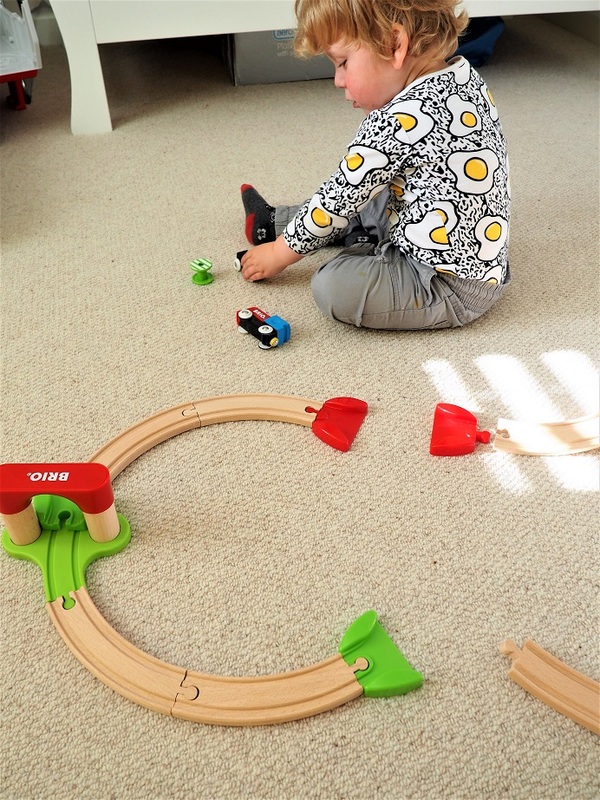 My children and I love our train track – its one of those toys you always keep! I would love to get this for my little ones but I know they would throw the bits everywhere ? The tracks are truely well made! It’s so cute isn’t it. Always loved wooden toys as they just don’t break. 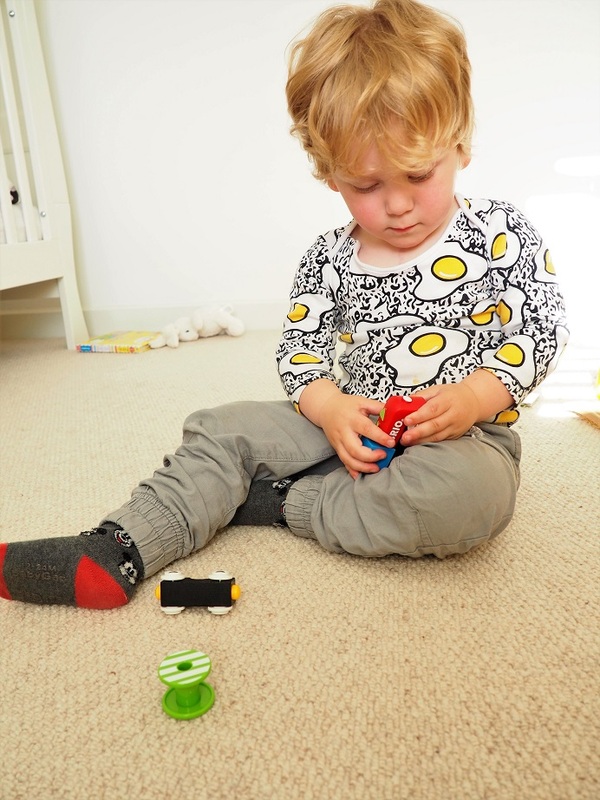 These toys are lovely – simple and safe – I love them. Aww need to get my LO a train set – this looks really sturdy which is good as shes quite heavy handed!! I just adore Brio! This sounds great…. my 18 month old daughter loves trains!